Not to be confused with Halloween, Day of the Dead is more like a combination of Memorial Day and Thanksgiving. 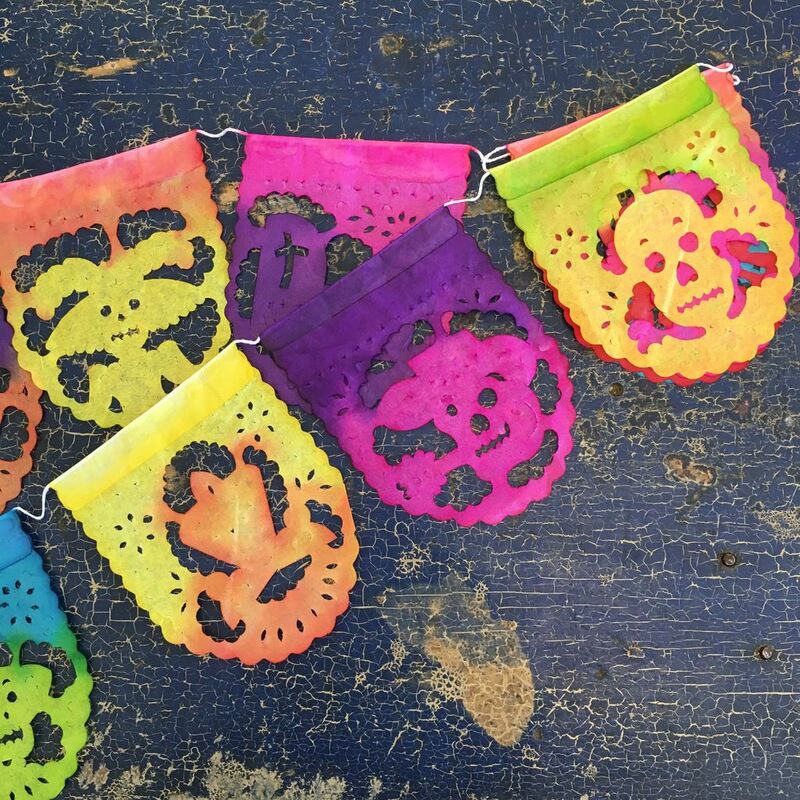 As the Mexican celebration of El Dia de Los Muertos (the Day of the Dead) approaches, you’ll see the distinctive skeletons and skulls everywhere. But don’t confuse them with Halloween décor. Day of the Dead skeletons or “calacas” are not designed to scare; they are meant to depict an active and joyful afterlife. 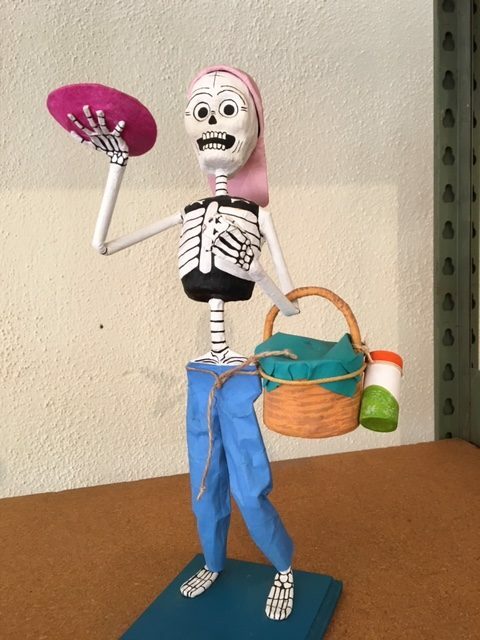 As many of us learned from the 2017 animated movie “Coco,” Day of the Dead (November 1 and 2) is the holiday for gathering to remember and honor people who have died, tell stories about them, and try to entice their spirits to come back with their favorite food. 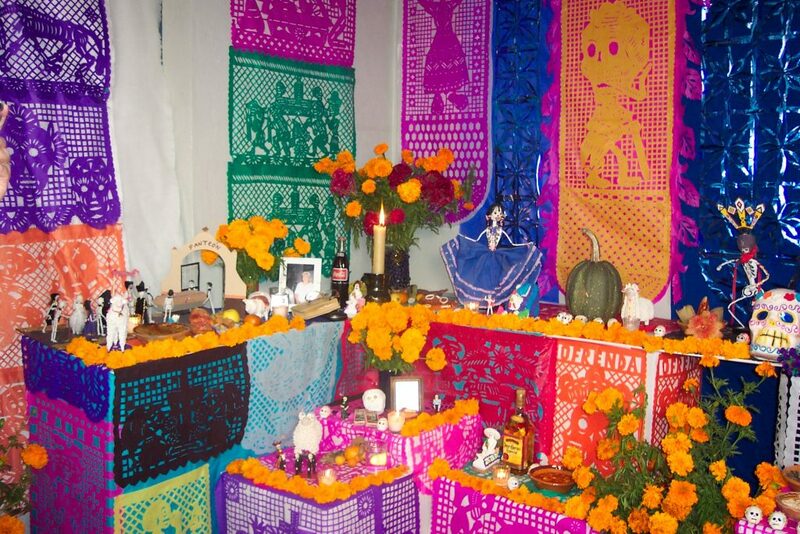 Some people build ofrendas, private altars to honor the deceased, that are decorated with calaveras (sugar skulls), cempasúchil (Mexican marigolds), and favorite foods and beverages of the departed. 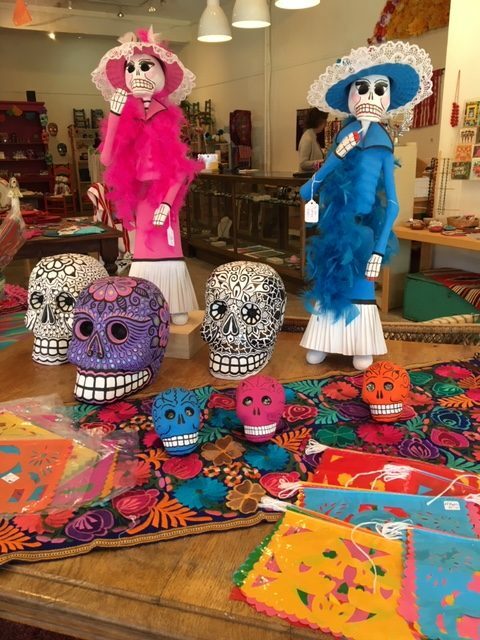 Anne Damon, owner of Zinnia Folk Arts in south Minneapolis, frequently travels to Mexico and has been there for Day of the Dead celebrations. She likens the holiday to a combination of Memorial Day and Thanksgiving. “Cemeteries are filled to the brim with people, candles, and flowers. It’s just beautiful,” she says. 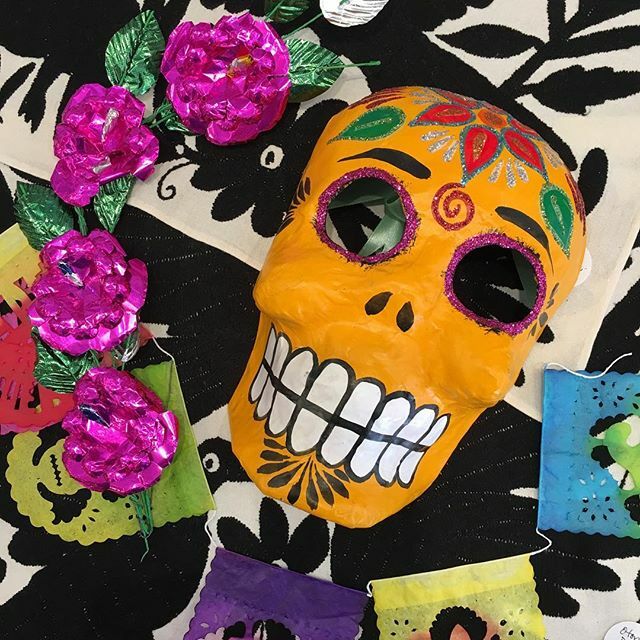 In this country, Day of the Dead has been thoroughly commercialized, what with themed merchandise available at Target, Pier One, Wal-Mart, Party City, et al. The skulls, skeletons, and marigolds are made in China, however. You’ll have to search out specialty shops like Zinnia for items made in Mexico. These female skeletons, often depicted with large elegant hats, originated as a commentary on the divide between rich and poor in Mexico. Turn-of-the-20th-century cartoonist Jose Guadalupe Posada created the figure to satirize the rich. “In his black-and-white etchings, he mocked the perception that the rich could somehow avoid death,” says Damon. Male skeletons are called catrins. 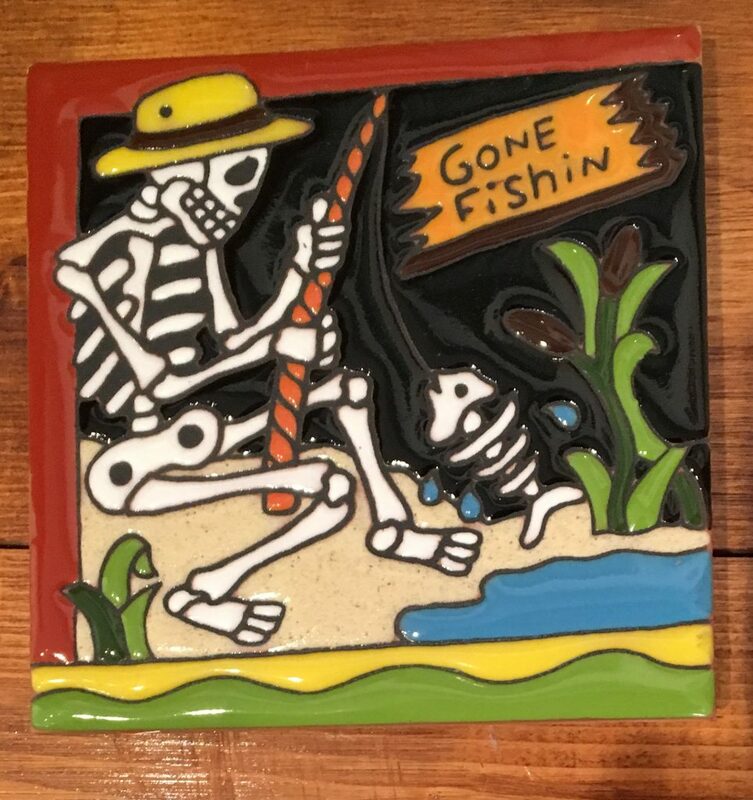 In time, skeletons dressed up in clothing and doing things that the living do, spread to many corners of Mexico. They may be made of clay, papier-mâché, paint, or wood; they may be humorous or stunningly beautiful. 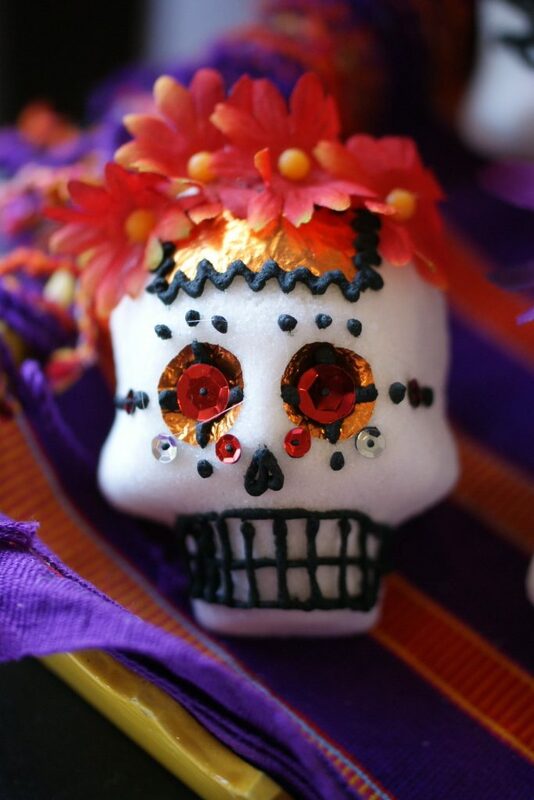 These beautiful skulls made out of sugar are often decorated with flowers or glitter. Sometimes, the name of the loved one is written across the forehead. All Mexican fiestas include picked paper flags. Those for Day of the Dead have images of skulls or catrinas.